The Synodal Commission for Mathruvedi is to maintain a strong communion of mothers of the Syro Malabar Church at the global level. Standing close to the Church, it ensures the participation of the mothers in establishing and strengthening the Kingdom of Jesus Christ. Developing and nurturing the leadership qualities of mothers. Standing for the protection of women and children in the society. Working for the integral development of mothers of the Church. Holding up the dignity of human life and promoting the culture of life in society. Membership: This communion is meant for all the married women in the Syro-Malabar Dioceses and Mission Centres all over the world. General Body: consists of the Mathru Vedhi President, Vice-President, Secretary, Joint Secretary, Treasurer from Syro-Malabar Dioceses and mission Centres; also the 2 Mathru Vedhi Senate members nominated by the Diocesan Committee. Diocesan Directors and animators are Ex-officio members at the General Body who have the power to vote. The leaders are selected from the Senate members of the General Body. Central team and Diocesan team should not be having the official duties at the three-tier Panchayats, simultaneously. •	The Dioceses of Syro-Malabar Church are divided into 4 zones, and conventions were held at Changanacherry, Thrissur & Ernakulam zones. The presence and support of the Bishops were ensured during the conventions at each zone. 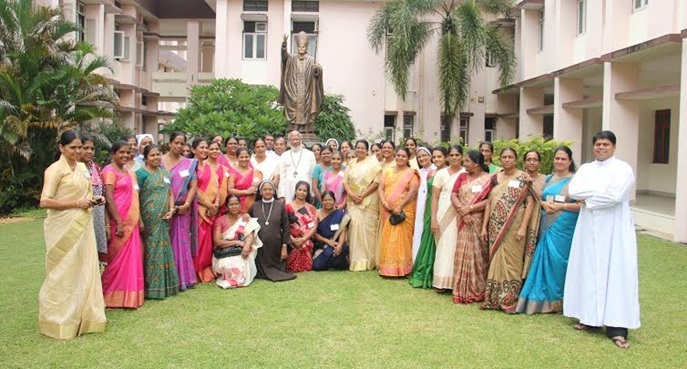 •	A National Women’s Conventon was held on 24th August 2013 at St. Thomas Mount Kakkanad, in which 600 women participated and, since the Bishop’s Synod was going on, 35 Bishops were present on the occasion. •	On 1st Aug 2013, at the request of Major Archbishop Mar George Cardinal Alencherry, the CMC General Council has given 2 rooms and a toilet (rent free), for the time being, in order to function as the Central Office of the Mathru Vedhi. This is in the Women Welfare Centre building adjacent to the CMC Mount Carmel Generalate, Thaikkattukara, Aluva. •	A Professional Women’s Meet of different Dioceses working in different fields was held on 9th March on 2014 and in order to make proper use of their service at the local Church and society levels, discussions were held and suggestions were collected and in the valedictory session 15 women from among them were honored. •	National President of the Mathru Vedhi, Smt. Delcy Luckachan presented the report of the Association and spoke in the Bishop’s Synod (18th August 2014), representing the women’s Cell. •	On 19th Februay 2015 Leadership Training Programme was held for the elected members from different dioceses. 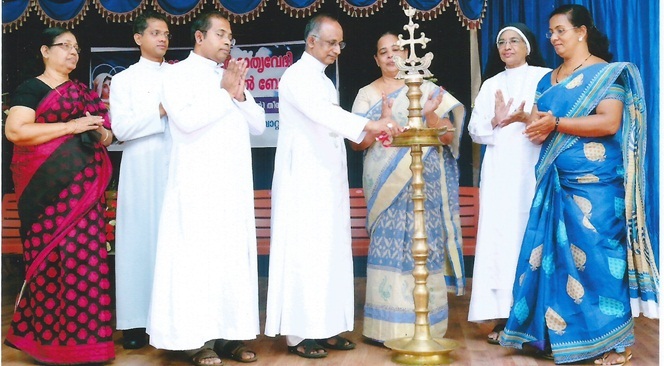 •	Visit of the different Mathru Vedhi Centres in various Dioceses in and or of Kerala: The Mathru Vedhi National Executive Members were committed to visit all the Diocesan Unit of Kerala and 6 Dioceses Stationed outside Kerala. Thus they came to get the first hand knowledge of the functioning of Mathru Vedhi in different Dioceses and they could confirm their cooperation. •	The new Constitution of Mathru Vedhi was released by Mar Mathew Anikuzhikattil (Bishop Legate, Bishop of Idukki), on 30th July 2015, at the National Executive Meeting held at the Central Office in CMC Generalate Aluva. •	On 11th September 2015, what’sapp group on Bishop was formed; a new flag was designed and the Syro-Malabar Mathru Vedhi emblem was made. •	National General Body Meeting, inaugurated by Syro-Malabar Major Archbishop Mar George Cardinal Alencherry, was held at St. Thomas Mount Kakkanad, on 12th & 13th July 2016, in which 60 members pariticipated. All Materials contained in this site, whether written, audio or visual are the exclusive property of SMCIM and are copyright protected.